Choosing and installing brand-new tile doesn’t have to be a stressful endeavor thanks to the tile flooring products and services provided by Flooring America. Our team of experts works with you to bring your unique style to life while giving you the best tile flooring installation services in the area. Avoid costly mistakes and unsightly workmanship with our professionals! Tile is a versatile flooring option that can be used in a number of different rooms or areas in your home or business. The important thing to keep in mind, however, is that the type of application you use will directly affect the longevity, look, and usefulness of your new tile flooring. Our team is ready to help you figure out what type of tile and application process is right for you, so that your tile will always look good. Proper tile application matters whether it is in dry places like your kitchen or foyer, or in wet areas, such as your bathroom or shower. Are you trying to figure out which tile floor options are right for you? If so, let our team do the hard work for you! We teach you about all possible choices and the unique benefits and issues that they bring to any installation. Whether you are looking to install tile flooring made from clay, minerals, solvents, or any other type, our experts are ready to help you choose what best fits your lifestyle and budget. The more you know the easier it will be for you to make an informed decision for your installation project. What Are the Factors of Tile Flooring Installation? The benefits of installing a new tile floor in your home or office are numerous. But there are a few factors to address before starting a tile flooring installation project. The first factor is to figure out the right type of flooring to fit the area you are looking to upgrade. 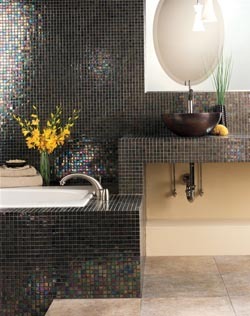 Choosing the wrong size, style, or texture of tile for your room can end up making your project an expensive mistake. Once the right tile style is chosen, you are ready to decide on the look of the tile as well as the appropriate grout color and width. With the help of our installation team, these choices will be easy to make and you will end up with the exact floor you want and need. Find the best fit for your flooring needs from our company. From gorgeous tile flooring with a “wow” factor, to flooring designed for durability and ease-of-care, our friendly flooring associates are always ready to guide you toward the tile flooring that fits your needs. Still not convinced? We also provide the latest durability and customer satisfaction ratings, so you can see just how satisfied previous customers were with the choices you are considering. Contact us for complete tile flooring installation in Ankeny IA. All of our friendly staff is proud and ready to assist customers throughout Ankeny, Saylorville, Bondurant, Altoona, Elkhart, Polk City, Mitchellville, and the Johnston communities.